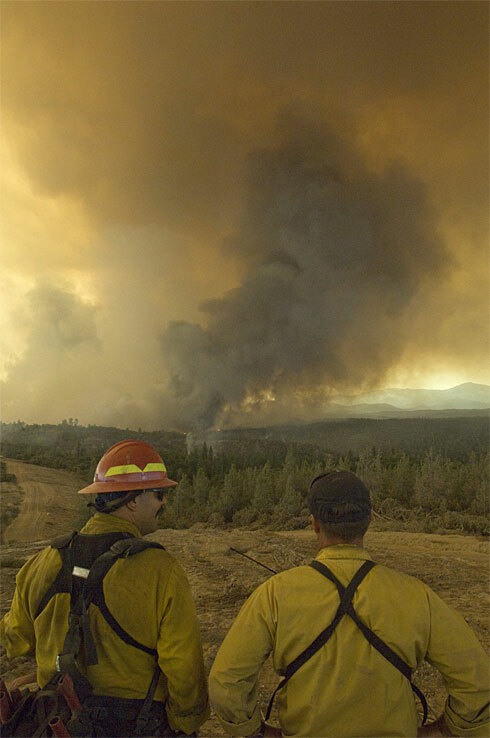 Firefighters watch branches of the Telegraph fire converge near Greeley Hill, Calif. Tuesday. Various roads between Mariposa, Midpines and Greeley Hill. Parts of the communities of Mariposa, Midpines, Greeley Hill, Coulterville, and Briceburg. For the latest on evacuations contact (209) 966-1133. Cooperating Agencies: CAL FIRE, Mariposa County Fire, Mariposa Sheriffs Department, BLM, USFS, National Park Service, OES, CCC, and California Department of Corrections and Rehabilitation. The fire is burning in the Merced River Drainage, on both sides of the river. The fire is burning with a rapid rate of spread in multiple directions. Accessibility problems due to steep and rocky terrain. Active fire behavior is being observed in all directions primarily on the south and east flanks. The fire is causing partial and complete closures of Hwy 140 leading to the main entrance to Yosemite National Park. For the latest highway conditions visit Caltrans. CAL FIRE Incident Command Team #8 is in command of the fire.